The club’s fundraising initiative in support of the Sean Cox Rehabilitation Trust is supported by Ireland v Liverpool Legends Organising Committee members, Michael O’Flynn (left) and Fergus McNulty, who are pictured with Clanns and Dublin footballers Kate McKenna and Evan Caulfield. (Photo courtesy Julien Behal). Events off the field of play have been as dominant as on-field activity at Clanna Gael Fontenoy over recent weeks; from recognition of club members for their role in the wider community to reaching across the sporting divide to participate in other sports at the highest level. It was great to see two club members, Jay Byrne and Conor Barnes, each receive a Sean Moore Community Award for their services to the community. In addition to support which both give towards a range of activities at the club, Jay was commended for his dedication to other community support work he’s been doing for many years; while Conor was singled out for the assistance he recently provided to a woman in distress on the banks of the Liffey. They received their awards at a ceremony which was attended by record numbers, including Deputy Lord Mary and Councillor Frank Kennedy (who presented the awards), Councillor Dermot Lacey, Senator Kevin Humphreys and Jim O’Callaghan TD. Conor Barnes was also among the four club members – along with Claire Byrne, Maria O’Dea and Ella Thiourrez – to be nominated for a Dublin South Central Garda Youth Award. They were nominated in respect of their exceptional voluntary contribution to the youth in the community through their club over a number of years and the excellent role models that they represent for the youth in the area. They were presented with their Certificates at a ceremony in Google in Barrow Street. The club was pleased to launch a fundraising initiative in support of the Sean Cox Rehabilitation Trust, to coincide with the Ireland v Liverpool Legends soccer match in the Aviva Stadium on April 12th. Seán Cox is a 53-year old husband and father of three from Dunboyne in Meath. An avid GAA supporter who formerly served as Chairman of St Peter’s GAA Club in Dunboyne as well as a lifelong Liverpool FC fan, he travelled in April 2018 to the Champions League semi-final between Liverpool and AS Roma in Anfield. Just before kick-off, on his way to the stadium, he was the victim of a vicious and unprovoked attack, which left him with life-changing injuries. Our initiative was supported by Ireland v Liverpool Legends Organising Committee members, Fergus McNulty and Michael O’Flynn. 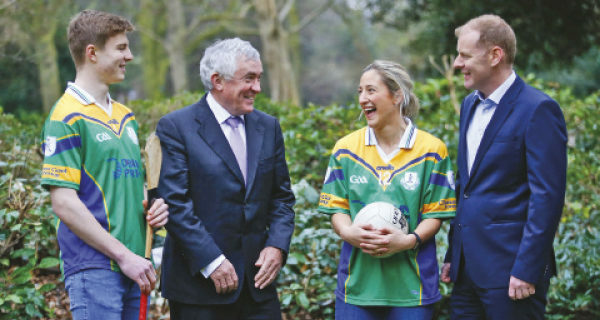 Fergus is the current Chairman of St Peter’s GAA Club, while Michael was instrumental in arranging for the Liam Miller Tribute match to take place in Cork’s Páirc Uí Chaoimh last September. The club had the distinction of having no fewer than nine of our current crop of young footballers involved in the recent Leinster Schools Senior Rugby Cup Final. Conor Hennessy, Karl Morgan, Brian Barron and Colm Kirby O’Briain started for the Gonzaga College side, while Rory O’Kennedy was also involved with the wider panel. On the victorious St Michael’s side Rohan van den Akker, Jack Guinane and Jeffrey Woods played their part in the final, with Hugo McWade also involved in their wider panel. It’s a clear sign of the talent and versatility of our young players today that many of them can and do play a number of sports at the highest level, as well as the complementary nature of these sports. Moreover, a number of these players are currently involved in Dublin under-age football and hurling squads, having already won a Dublin U-16 football championship with Clanns in 2017. There is no doubt that, for any club to be really successful, it needs strength in depth. So it bodes well for the future of our club that, after an absence of many years, a new Junior Men’s football squad has been formed for the 2019 season. The squad caters for minor players who have successfully completed their journey through the juvenile ranks, for intermediate players who are stepping down from the demands of that level, as well as other players who would like to get back into Gaelic football, having taken a break for whatever reason. And of course new players are welcome at any time. What’s also welcome is that they’ve got off to a flying start by winning their competitive games to date. In their momentous first outing away to Lucan Sarsfields they recorded an impressive 2-16 to 0-6 win. A mixture of the old and the new, the team was ably led by Simon Beirne in midfield, with JP Pugh holding things tight at the back and Colley Reynolds rolling back the years with a high-scoring display at full-forward. The younger lads were also not found wanting either, with Emmet Bolster stamping his presence on the game from the start right through to the final whistle; Scott Collopy contributing some fine scores and Iggy O’Loughlin marauding up the pitch from his full back berth. Team mentors, Michael Costello and Roger McGrath, were understandably delighted with the debut performance. And they’ve had further cause to be satisfied, as the team has also gone on to win their other competitive fixtures. So things are looking good for this group of players and for the future of football at the club – especially with the Intermediate Football team also going well and already building nicely on a very good 2018 season.